Use your company’s resources more efficiently, save money and time, and create a more cohesive workplace environment when you integrate your small business’s lights and thermostat with your Secom security system. Reduce energy costs and increase employee comfort with Secom’s smart thermostat solutions. Use automated scheduling to set thermostat back when security is armed. Ensure your company is comfortable for employees and guests during business hours, while conserving energy when everyone is gone for the day. 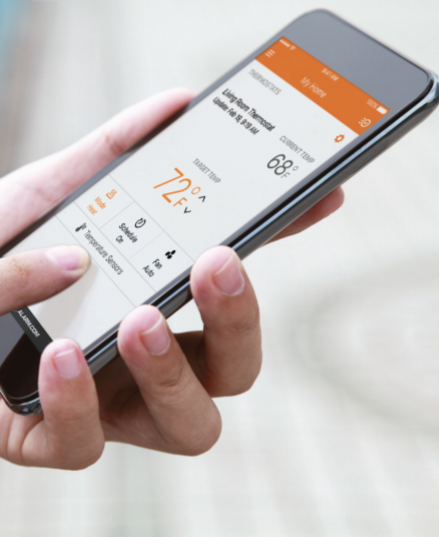 Receive notifications on your smartphone or mobile device if thermostat is adjusted while you are away – or if the temperature rises or drops dramatically. Set a temperature range that fits your business and enable lock-outs remotely to reduce energy costs. Employ real-time local weather conditions to adjust your thermostat settings in the event of a heat spike, saving your small business money. Using an app on any smartphone or mobile device, Secom allows you to create and manage lighting schedules that best fit your business. When you disarm security and enter your building. At strategic intervals after business hours to deter trespassers and intruders. Reduce installation hassles and ongoing costs. Conserve resources while gathering data to help you manage energy more efficiently. Improve your company’s productivity and response time. Provide added comfort, convenience, and confidence for your employees, clients, and guests. Receive immediate notification via email or text for any anomaly, breach, or inoperable system. Are you interested in increasing your company’s energy efficiency?